Welcome back for another installment of Texas Tuesday, Pint Jockeys. 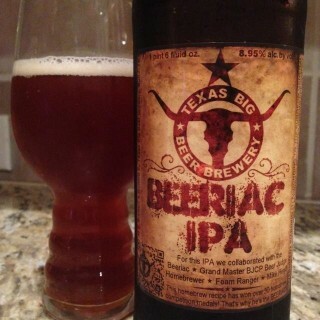 If you’re looking to stock said cooler with an IPA in addition to all those pumpkin seasonals we know you love so much, look no further than Texas BIG Beer Brewery’s Beeriac IPA. In stores now, Beeriac was first released as a “Pro-Am” in June and based on home-brewer Mike Heniff’s award-winning IPA. This one is packed with so many hops that Texas BIG Beer Brewery had to modify their equipment to accommodate all that hoppy goodness in order to make this much wider Fall release happen. Pint Jockeys at our October tasting events in Victoria and Beaumont had a chance to sample this fantastic IPA with a thick, hazy amber and copper-colored body that leaves a thick and frothy white head and substantial lacing when poured. Its aroma is full of orangey, citrus notes mixed with light pine smells and some caramel sweetness and of course, the smell of LOTS of hops. The flavor profile is equally engaging, with citrus tastes accompanying a low amount of bitterness up front, followed by some sweet caramel tastes with a medium mouthfeel and medium carbonation. One of our personal favorite styles to sip, India Pale Ale gets its name and unique character from British brewers who were making beer for export to India. The intense hop flavor in this beer was used to preserve it for the long journey and the aroma is traditionally VERY strong. IPAs pair especially well with spicy foods including chili, Sichuan cuisine and Thai cuisine. For those who have already experienced this BIG beer, what did you think? For those who haven’t tried it yet, we hope you will and report back here in the comments section with your review. As always, cheers to Texas Tuesday and cheers to you, Pint Jockeys. Have a safe and happy Halloween! Island Oktoberfest is just days away, Pint Jockeys! Beer, brats and big-time live entertainers are all on the roster for this weekend’s festivities. The FREE festival takes place in historic downtown Galveston on the grounds and streets adjacent to First Lutheran Church, 24th and Winnie from 5PM-11PM on Friday, October 25th and 11AM-11PM on Saturday, October 26th. Read on party people! DO remember the history of Galveston’s Island Oktoberfest, because it’s pretty cool. The festival was first celebrated in 1981 by members of First Lutheran Church who traced their roots back to German immigrants of the mid-1800s. What started simply as a fall activity for the congregation in the courtyard of their Parish Hall has grown into Galveston Island’s premier fall event, attracting over 15,000 festival-goers each year at the two day event. DON’T miss out on live entertainment at the festival. 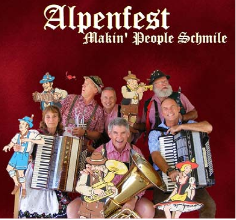 Back for their 21st year at the festival, one of the most popular German bands in Texas, Alpenfest is set to take the stage on Saturday from 11AM to 6PM. Audience participation is important to this “oompah band” who is known to regularly play the “Chicken Dance” and other songs that get the audience movin’ and groovin’ to the unique sounds of 13-foot Swiss alphorns, a tuned set of Austrian cowbells, a German xylophone, musical hand saws and yodeling. 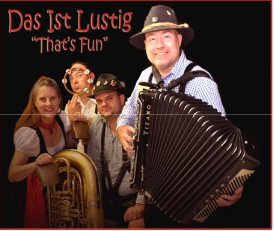 AlpenMusikanten, a new German band at this year’s festival, is set to perform from 7PM to 11PM on Saturday night. Their motto is one we’re sure you can appreciate, Pint Jockeys: “Will Polka for beer… but will settle for a Schnapps, or wine, or a well-mixed vodka tonic.” Also on-hand to entertain you will be Midlife Crisis, playing hits from the 50’s, 60’s and 70’s, Kevin Anthony, churning out Cajun and country tunes, Das 1st Lustig with more German jams, Kerry Christensen playing a mix of just about everything, and The Tuba Meisters, a tuba/euphonium quartet. Fanfare! The Lutheran Music Academy’s children’s choir and the Deer Park Folk Dance Group are also sure to impress. DO make your way to the Texas Tent at the festival. Stocked with craft beer from your favorite Texas-based breweries, we’re sure this will be your first stop! Does it get much better than these big five names? Saint Arnold, Karbach, Pedernales, Southern Star and Rahr & Sons. We don’t think so. Del Papa Distributing will be serving em’ up nice and cold all weekend long. DON’T forget to stay hydrated and designate a driver. You know the drill, Pint Jockeys. Sip your craft brews responsibly, and be sure to drink lots of water between your Saint Arnold Amber Ale and Karbach Karbachtoberfest. Make sure you and your buds have designated a sober driver to and from the event, to be sure everyone has a FUN and SAFE Oktoberfest experience. DON’T miss this event! Cheers to Island Oktoberfest and cheers to you, Pint Jockeys. We’ll see you there this weekend! The article below was contributed to the October 2013 Events Book Southeast Texas by Del Papa Distributing’s own craft, specialty and import account development manager, Jeff Wheeler. Read on to get a taste of the history of Oktoberfest in Southeast Texas and info. about tomorrow’s Art of Beer event in Beaumont. It’s the most wonderful time of the year… for beer! After months of braving the sweltering heat while sipping Lagers and Blonde Ales, we can finally sit back and enjoy the majestic time of year when craft brewers set aside their refreshing summer beer recipes and fire up the brew kettles to concoct bold, complex and full flavor brews that warm the soul and tickle the tongue. No beer style best exemplifies this welcomed calendar swing like the ever popular Marzenbier, now commonly known as Oktoberfestbier. German for “March beer,” Marzenbier is a deep amber lager with a full body, low bitterness and tasty malt sweetness. Historically, Marzenbier came in to existence from a decree issued in 1553 by the Bavarian ruler Duke Albrecht V, in which he outlawed all brewing between April 23 and September 29. This was to prevent any brewing during the warmer months when bacteria would often infect the brew and spoil it. To avoid spoilage, brewers would make huge batches of beer in the month of March and then store or “Lager” the beer in cool temperatures, thereby preserving the flavor and integrity. In 1872 Spaten Brewery pioneered the Oktoberfestbier style, which is essentially a Marzenbier called by a different name, and brewed it expressly for the largest beer party in the world, Oktoberfest, in Munich, Germany. 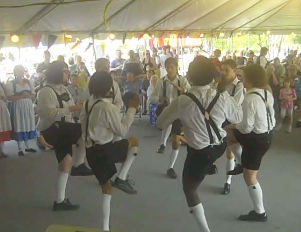 Attending Oktoberfest in Germany is certainly a “bucket list” experience, but there’s no need to hop on the next flight to Munich because the Art Museum of Southeast Texas offers its own one-night version of Oktoberfest in Beaumont. Now in its fifth year, Art of Beer gives everyone from the novice beer drinker to the certified beer geek a chance to try more than 100 different styles from breweries all over the nation and the world. With live entertainment, food pairings, an auction and beer experts on-hand to answer your most creative questions, this event is not to be missed. Art of Beer will not only enhance your beer drinking knowledge, but is also is a wonderful opportunity to support the arts. 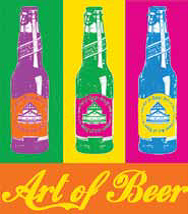 Art of Beer takes place on Wednesday, October 9 from 6:00 pm – 10:00 pm at the Art Museum of Southeast Texas in Beaumont. Individual tickets are $50 for members and $60 for non-members, and include beer tastings, food, and a souvenir glass. For more information about the event, call 409.832.3432. Saint Arnold Oktoberfest: Sweet, biscuity and a little bit dry, this great American style Oktoberfest should not be missed. Brewed in Houston with pride and over 18 years of tradition. Karbach Karbachtoberfest: This brew is one of the newest additions to the area’s seasonal options. Brewed in Houston, this beer is modeled after the beer served at the Oktoberfest in Germany. Paulaner Oktoberfest: This traditional Oktoberfest beer is as close as you will get to drinking liters of beer while wearing lederhosen in Munich. That’s because this is the actual beer consumed in the Winzerer Fahndl tent at Oktoberfest. Crisp, malty and dry, this is one of the best style examples anywhere in the world. See you at Art of Beer. Cheers! Welcome to the first day of October, Pint Jockeys! Who’s as excited as we are for the promise of cooler weather, Halloween parties and all the football your heart desires? We are, and we’re (of course) also looking forward to attending Oktoberfest festivals and drinking fantastic seasonal beers. One such seasonal we can’t get enough of is Fredericksburg-based Pedernales Brewing Company’s Lobo Oktoberfest, the brewery’s FIRST EVER seasonal beer. This brew is medium-bodied with a big, malty taste and some slightly assertive hops. This Amber Ale has an extremely smooth finish and is highly drinkable. So drinkable that you may want to stock up on it the first time you see it in-stores, as only a few dozen barrels were made. While Pedernales is currently in the midst of expanding their brewery and a larger release is expected next year, this one is definitely limited so heed our advice and pick some up today. Check out the brewery’s Facebook page to stay on top of where it’s popping up around town at local tastings and pint nights. We hope you’ll check Lobo Oktoberfest out and leave us your full review in the comments below, Pint Jockeys. As always, cheers to you and cheers to great Texas beer! P.S. – We’ve got a mission for you. We’re shooting to get 1,000 fans on our Facebook page and need your help to reach our goal! Tell all your craft beer loving friends to “like” our page. Trust us, it’s worth it; there will be a prize in store for one lucky fan when we reach the mark.